When it comes to audio editing software, most of the well-known choices have been around for many years and are very mature applications. The same may be true of Sound It!, produced by the Japanese developers Internet Co Ltd, but it’s likely to be less familiar to Western studio types. Could that be about to change with version 8? The new release has been fine-tuned for the English-speaking market, and with both Windows and OS X versions available, the company are clearly intent on expanding the product’s reach. On paper, the feature set looks promising and, with an impressive bundle of plug-ins included and the intriguing option of support for DXD/DSD native audio (with suitable audio hardware), it has features that may well appeal to both those new to audio editing and those working in more niche, high-fidelity environments. Sound It! 8 Pro (which I’ll call SI8P from now on) has a solid set of basic audio editing features. 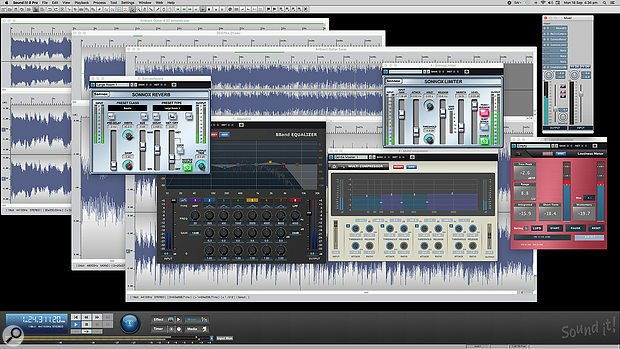 These include typical file editing options, audio format conversion, a broad array of bundled plug-ins (spanning EQ, dynamics, spatial effects, modulation and mastering treatments), basic automation, useful metering tools, batch processing, well-featured CD creation, the ability to create Acid files and, as mentioned earlier, support for handling DSD and high-resolution PCM (DXD) files. Exactly what you can do with these more specialist audio formats depends upon the specification of whatever audio interface you might have available but, even so, DSD support is a rarity amongst the mainstream audio editors. SI8P provides all the routine editing options required for working with mono and stereo audio files.The software is available as a download, and installation follows pretty standard procedures under both Windows and OS X. Although I’ve experienced slicker installation and authorisation processes, Internet Co’s gets the job done. It’s also worth noting that there is a fully functional (bar some batch and export options) three-day trial available. This is a sensible policy and will be very welcome for potential new purchasers. The software also includes a comprehensive PDF manual that, despite a few ‘second language’ issues, provides a good introduction to the feature set. SI8P’s graphical user interface is pretty conventional, with a main menu and toolbar strips that provide easy access to many of the key file-management and editing tools. At the base of the display are the transport controls, which include a jog wheel, and four additional buttons to access the Effects, Mixer, a Timer to make timed audio recordings, and a Media Browser. All these features are kept fairly compact so that the central portion of the display can accommodate floating windows for your open audio files. Multiple files can be opened at the same time, and are displayed in separate windows, each with an ‘overview’ waveform at the top and a more detailed view underneath. You can use the former to navigate the latter when zoomed in on the lower waveform display. The main windows can be resized, as can both the upper and lower panes of the waveform display. It’s also worth noting here that although there are plenty of options for audio formats, bit depths and sampling frequencies, surround files are not supported. Routine recording and editing tasks will feel intuitive to anyone with experience of another mainstream audio editing environment. When you create a new empty audio file, you can specify its format and, providing your audio hardware is connected and configured, you just hit the record button and off you go. You can record multiple times into a single file, whether adding new material at the end or dropping in within the middle of a recording; existing audio is simply shifted along the timeline to accommodate it. Volume and pan automation envelopes are available.Editing options include the usual copy, paste, cut, trim, merge, fade, crossfade, gain adjustment and so on. If you make a selection in one file, then drag and drop it onto an open spot in the workspace, the selection is automatically turned into a new file. Dragging and dropping audio between open files is also supported. SI8P also offers basic automation options for volume and pan. This uses conventional envelopes within the upper overview waveform display, and new nodes within the envelope can easily be created and then edited. SI8P includes multiple marker types and easy editing via the Marker List.You can place four different types of marker within an audio file: Generic, Division, Region start/end and Chapter. These are stored if you save the file as a WAV or in SI8P’s own SIW file format. Markers can be created automatically to mark the locations of transients, or points where silence is detected. 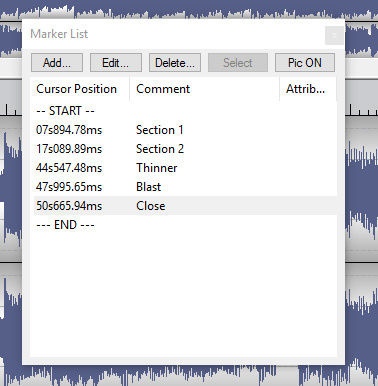 As well as allowing you to navigate quickly between sections of a file, Division and Region markers, once placed, let you quickly generate separate audio files based upon marker positions, or populate the Play List if you want to build a CD layout for burning. 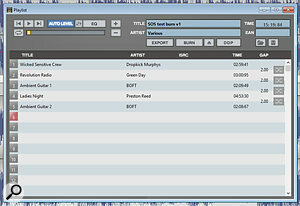 The Play List itself provides an unfussy system for putting together a CD project. 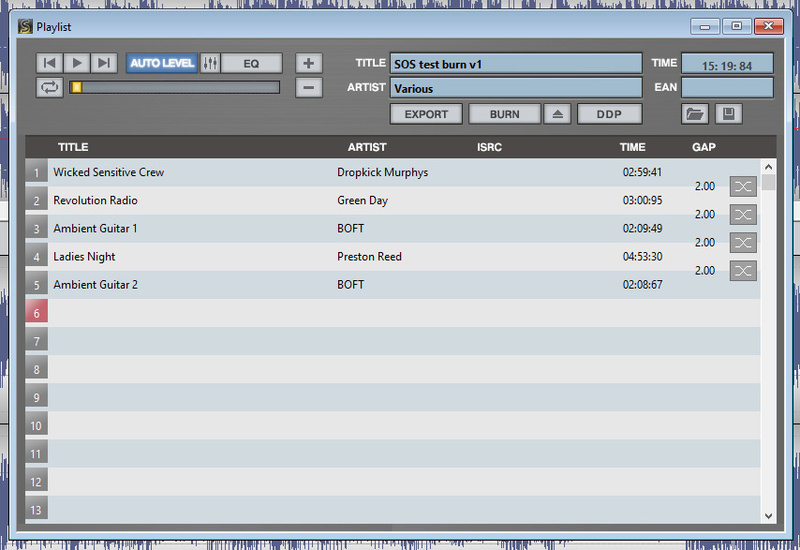 Here, you can add suitable file formats to the track list section, specify some metadata, apply level matching or global EQ, audition the sequence of tracks and apply an appropriate crossfade or gap between tracks before burning to your CD-R/RW drive. The combination of using Division Markers and the Play List (including the crossfade option) might make for an appealing combination for producers who work with stereo recordings from live performances and wish to render them to a CD format. Incidentally, you can also export Disc Description Protocol (DDP) files for delivery of disc masters for duplication. Oh, and SI8P will also import audio from a CD and convert the contents into audio files. The Play List provides easy CD construction and burning, and links well with the Marker system.There are a few other core features worth mentioning. First, SI8P can export Acid-formatted WAV files. Although Acid Pro is perhaps not as widely used as it once was, the file format is used by lots of other programs too, and unlike WAV or AIFF, provides a way of embedding tempo and pitch information. Second, the software will import a MIDI file and, using a GM-style sound set, will convert the MIDI file into an audio render. Yes, the results are suitably cheesy, but it does work and I’m sure some might find it occasionally useful. Finally, the Tools menu includes a compact Batch Processing option where you can configure a small number of file manipulation options and apply them to all the audio files within a single folder, and export the processed files to a second folder. The most obvious application would be to convert a collection of files to a different format, but you can also apply gain changes, normalisation or fades. As well as the range of standard editing features described above, SI8P also ships with an extensive range of VST and/or Audio Units plug-ins. There are 49 in total, spanning a pretty wide range of the typical processing and effects options. Some of these, such as the various modulation plug-ins, would perhaps be more obviously at home within a music production environment, but those involved with sound design will, no doubt, be able to put them to good use. The EQ, dynamics, audio restoration and metering options are pretty sophisticated, catering to all sorts of audio editing duties as well as DIY mastering. Taking the latter application as an example, you could construct a suitable processing chain from the eight-band EQ, the Multi-Compressor, Stereo Enhancer and either the Maximizer/Limiter or Sonnox Limiter. While this might lack the integrated approach offered by (for example) iZotope’s Ozone or Wavelab’s MasterRig, the tools are all there. The last of these plug-ins is just one of several Sonnox processors included within the overall bundle. The others include the rather nice Sonnox Reverb, EQ/Filter and three audio restoration options: De-Buzzer, De-Clicker and De-Noiser. These versions have been around for a while, but they still do a very respectable job for basic clean-up tasks. Those handling field-based audio recordings made in less-than-ideal circumstances would, I’m sure, find them very useful. Plug-in chains can be constructed in the Mixer panel, but it’s a shame there is no system to save and recall plug-in selections.Plug-ins can be applied in two ways. First, you can apply effects or processing directly to an individual audio file or a selection of audio within an open file. While you get the option to audition what the processing will do, once you commit, the processing is applied destructively (as was the case with Sound Forge for many years). Alternatively, you can open SI8P’s Mixer panel, where it’s possible to construct a chain of up to eight effects. These are applied non-destructively in real time. The contents of the Mixer panel effects chain are set on a ‘per file’ basis rather than gloabally, with the Mixer panel configuration being stored alongside the audio file and recalled whenever the file is reopened. A Freeze option lets you apply the Mixer effects chain permanently. This all works rather nicely and, as described above, you could easily imagine building a very functional mastering chain. However, as far as I can see, while all the plug-ins themselves offer preset systems, there is not a preset system for the Mixer’s insert effects chain itself. I can’t imagine this would be too difficult to implement but, without it, having to configure your favourite processing chain from scratch every time can quickly become frustrating. That said, the overall bundle is impressive and my only other comment is that the plug-in interfaces lack some of the consistency often found in ‘stock’ plug-in collections. One of Sound It!’s bundled plug-ins in particular is perhaps worth a few extra words. Now that we have all survived the loudness wars and, with a bit of luck, come out the other side with our ears intact, both hobbyist and professional audio engineers will appreciate the role of appropriate metering in mixing and mastering to appropriate loudness levels. SI8P supplies exactly that in the shape of the Loudness Meter plug-in, which can easily be dropped into the final slot of the Mixer panel to let you see exactly what’s going on. The meter supports EBU R128 (European) and ARIB TR-B32 (Japanese) standards and offers readings for integrated, short-term, momentary and maximum loudness, while you also get the loudness range displayed. The meter includes three ‘gate’ options to remove the effect of lower-level signals or silence on the meter’s averaging algorithms. You can also switch between relative and absolute loudness displays. While I didn’t do any exhaustive testing, a quick comparison between SI8P’s Loudness Meter and iZotope’s Insight suggested that they produced broadly similar results within the limits of their respective configuration settings and averaging processes. If you need to ensure your levels don’t fall foul of broadcast standards, therefore, the Loudness Meter ought to be a useful guide. The included Loudness Meter plug-in seems to do a good job, producing results consistent with iZotope’s popular Insight metering plug-in. One advantage of Internet Co’s very straightforward approach to the implementation of file handling and editing tasks is that the initial learning curve is not intimidating, and I think even those encountering audio editing for the first time would find SI8P very easy to get to grips with. I did the bulk of my testing with the Windows version and, overall, the performance was very solid and generally very smooth. I also had access to a beta of the Mac OS version. Visually, and in terms of operation, this is identical to the Windows version, to the point where it arguably ignores some conventions of OS X user interface design. The release candidate was made available just as we went to press, so the final Mac version should be on sale by the time you read this. Based upon my Windows experience, if you need a no-fuss program for routine mono and stereo audio file editing, SI8P is perfectly capable. It provides a compact set of features covering those tasks you might perform 90 percent of the time. The plug-in collection is also pretty comprehensive, with the inclusion of the Sonnox audio restoration tools a nice touch. I also found that, in use, the Play List made CD construction easy. As far as I could take it without specialised audio hardware, I was also impressed with the handling of DSD audio. On the down side, the lack of a preset system for the Mixer’s effects chain is frustrating; given that the generally straightforward design of SI8P means repetitive tasks can otherwise be dealt with efficiently, it’s a pity that one of the most important, most repeated tasks — configuring your processing chain — can then slow you down. This is a shame and, hopefully, something that can be addressed in an 8.x update at some stage. All in all, Sound It! 8 Pro is a very competent audio editing environment for mono and stereo audio, with a good array of editing features for the majority of routine editing tasks, along with useful (and easy to use) CD burning options and an impressive range of bundled plug-ins. In terms of the competition, SI8P sits somewhere between Wavelab Elements and Sound Forge Pro both in terms of price and features. That might suggest it occupies a clear niche in the current market — or, alternatively, that the compact feature set is just a little too compact to attract the more experienced (demanding?) audio editor and the price point just a little high to attract the novice. Perhaps the key feature that sets Sound It! 8 Pro apart is the DSD audio support, but this is obviously something of a niche requirement, and it might be hard for an unfamiliar product to pull potential purchasers who don’t need that support away from such well-established competition. I don’t think Internet Co are too far wide of the mark, but I do wonder whether a more competitive price might make it easier for SI8P to establish a foothold outside of its Japanese homeland. The two most obvious competitors are Steinberg’s Wavelab and Magix’s Sound Forge. The full versions of both of these products are more expensive than SI8P and their prices are a pretty fair reflection of their respective feature sets, though neither supports DSD audio. The more affordable Wavelab Elements is perhaps closer to SI8P and, while it offers the same Sonnox restoration plug-ins and a decent complement of other processors, it can’t match SI8P in terms of features such as DDP support, comprehensive loudness metering or DSD audio support. It is, however, considerably cheaper. Tascam Hi-Res Editor, which is a free download from the Tascam web site, does provide DSD audio support but has a pretty modest feature set for routine editing duties. Mac: OS 10.9 or later, 64-bit, Intel multi-core i3 processor or better, 4GB RAM recommended, 1366x768 display resolution or greater, suitable Core Audio supported hardware, 300MB of disk space for installation, DVD-R/RW or CD-R/RW drive for CD burning features. PC: Windows 7 or newer, 64-bit, Intel or compatible processors with SSE2 support and 2.6GHz or better, 2GB RAM or more, 1024x768 display resolution or greater, any ASIO supported audio hardware, 300MB of disk space for installation, DVD-R/RW or CD-R/RW drive for CD burning features. One intriguing item in the SI8P feature list is its ability to handle high-resolution Direct Stream Digital (DSD) audio files. For recording and native playback in one of the DSD formats (DSD64/128/256) you need to have audio hardware that’s also equipped to handle these formats. These used to be something of a luxury item but, while the DSD format is still something of an audiophile niche platform, there are now streamlined, low I/O-count interfaces available such as the Roland Super UA at around the £250 mark for those who wish to explore the possibilities. 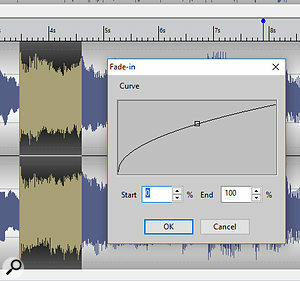 I didn’t have access to such an interface during the review period, but SI8P does still allow you to open DSD files without a suitable interface connected, offering to convert them into a PCM format at whatever bit depth and sample rate you care to specify, including rates that qualify for DXD (and which would be way beyond the sample rates supported by the vast majority of conventional audio hardware). Equally, you can choose to export any audio file in a DSD format should you wish and, again, you can choose between various formats. I experimented with loading and saving various DSD files with SI8P and, from a technical perspective at least, the process seemed to work very smoothly. The ability to handle the DSD format is something of a specialist requirement but, for some at least, it might be SI8P’s unique selling point. As far as I’m aware, none of the obvious mainstream audio editor competitors offer DSD support, although there are specialist tools for just this kind of application — Tascam’s Hi-Res Editor, for example, is available from their web site as a free download. Incidentally, if you want a brief introduction to the DSD format, then see Hugh Robjohns’ Q&A response back in SOS February 2009 issue. Very competent audio editing environment. Good collection of bundled plug-ins. DSD audio support for those who require it. No preset system for the Mixer plug-in chain. No surround support at present. Current price might make it difficult to challenge established competitors. Sound It! 8 Pro provides a solid, straightforward editing environment for mono and stereo audio, and includes a good collection of bundled plug-ins. However, unless DSD audio support is critical to your needs, there is stiff competition from the established market leaders. Apple iMac with 3.5GHz Intel Core i7 CPU and 32GB RAM, running OS 10.12.5, with Soundcraft Signature 12MTK interface. PC with Intel i5 CPU and 8GB RAM, running Windows 10, with Focusrite Scarlett 8i6 interface.